Visite la Isla Grande de Hawai y el volcán Hilo en esta excursión de 8 horas y media desde Oahu. 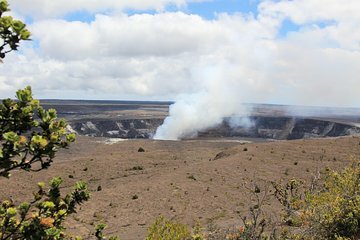 Mientras explora el Parque Nacional de los Volcanes de Hawaii, aprenda sobre la actividad del volcán a lo largo del tiempo y las características geográficas de esta isla única a través del comentario de su guía. Entradas y transporte de viaje encontrado, incluidos los vuelos, siempre. Was a fabulous tour, picked up from hotel at 7am and dropped off by 10pm. Would have liked to have stayed a little longer after sunset at the volcano as it was still a little light when we left and we feel the glow would have been a lot better if we could have stayed a bit longer. Lunch was good but maybe a bit pricey. Our tour guide was a sweat heart! She had a lot of knowledge about the island and made everyone feel welcomed. The actual tour was kind of slow paced. Took 6 hours to get to the volcano park as we were ferried about all over the island to places we did not want to see. Would have preferred to have spent longer in the volcano park as we only got a couple of hours there.